Rich push notifications enable you to communicate with your app users in a more creative and interactive way by adding images, GIFs, video and audio files to your notification content and including multiple options for how the user interacts with the notification. 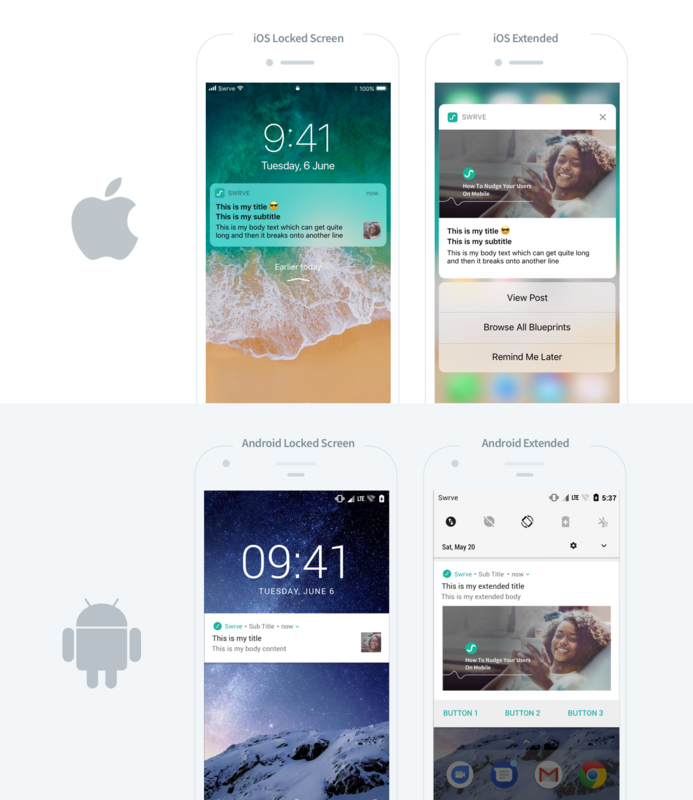 This article describes the options available in Swrve for creating rich push notifications on iOS and Android and provides examples of how to create different notifications in the Swrve dashboard. Swrve’s push notification editor enables you to create rich notifications and still include features such as personalization, localization or A/B tested content in your campaign. Rich push notifications are supported on devices running iOS 10 and higher or Android 4.1 and higher. To send rich push notifications in Swrve, you must upgrade your app to Swrve SDK version 4.11 or higher. Users who are on an older version of your app that is not running Swrve SDK 4.11 or higher will still receive push notifications, however they will only be displayed as text. If required, you can include custom fallback content for those users. On the Add Content screen of the push notification campaign workflow, the Media section of the editor provides several options for adding rich media and specifying fallback content if required. The following examples show you how to include different media types in your push notification. For more information on the push campaign workflow, see Creating push notifications. Android currently only supports including images or video links in rich push notifications. Swrve enables you to customize the media you include in your rich push notification, for example, using a custom URL that references a customer’s profile picture. The Media Fallback option lets you include fallback content for users who may be missing the specified property. To include a fallback, select Show Media Options to expand the Media Fallback section, and then select and specify the media you want to use. The Image option enables you to include an image that is displayed in both the locked, banner, or extended view of the push notification. If desired, you can personalize the image by including custom user properties in the image URL. For example, include a user’s profile picture or reference a specific destination to which they recently searched for flights or hotels. To add an image, select Image, and then upload the file you want to want to use or enter the URL for the main image. iOS automatically creates an icon of the image that is displayed in locked and banner view, however for Android, if you want to include an icon, you must upload a separate Icon image. While there are no hard limits on image dimensions, the following guidelines will help you make sure images are displayed correctly. The maximum file size for image attachments is 10MB. The maximum possible dimension is 1038 x 1038 pixels. iOS automatically scales images, but if the image height is more than 1038 pixels, it downscales the image and applies padding so the image is displayed as a square. To avoid this, use a maximum width of 1038 pixels and height less than 1038 pixels. You can use landscape or portrait orientation. Depending on the dimensions, portrait images may look too tall, therefore we recommend using landscape. Android doesn’t have a size limit on images in rich notifications, as it automatically adjusts images so the dimensions of the image are equal to or larger than the corresponding dimensions of the device view. Google recommends using an image with an aspect ratio of approximately 2:1. We recommend using landscape orientation, as some devices may crop the image. To ensure important information isn’t cropped, position your content in the center of the image and not around the edges. The GIF option enables you to include a GIF that is displayed in the extended view of the push notification. For example, to make the notification more memorable, include a GIF when announcing a new product or promotional sale. To add a GIF, select GIF and then upload the file you want to use or enter the URL. The maximum file size for GIF attachments is 10MB. 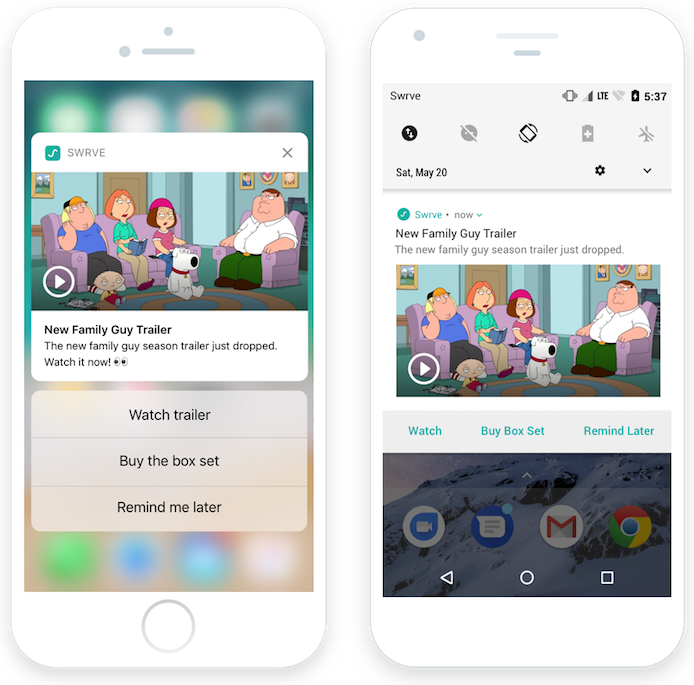 The Video option enables you to directly link to a video and provide options for watching the video in a related player (for example, YouTube, Vimeo) from the extended view of a push notification. For example, encourage customers to watch a preview or trailer of a new show or movie they might be interested in. To add a video link, select Video, enter the URL of the video you want to use and then either upload or enter the URL of the thumbnail image that will be displayed on the notification in locked or banner view. The Audio option enables you to include an audio file in your notification that a user can play directly in the extended view of the push notification. For example, include a teaser track from an artist’s new release or preview of a new podcast. To add an audio file, select Audio and then upload the file you want to use or enter the URL. Supported file types are MP3 and WAV. The maximum file size for audio attachments is 10MB. As the above examples show, Swrve’s push notification editor enables you to include up to three buttons to give your users custom options for interacting with the notification in extended view. You can configure the button actions with deeplinks to direct the customer to a specific screen in your app, or even use the buttons to create a short survey. For more information on how to configure custom buttons, see Creating push notifications. The button select results are included in the push notification campaign report. For more information, see Managing push notifications. This section describes some possible issues you may encounter if you’re having difficulty viewing rich push notifications on your QA device. Ensure your development team have upgraded your app to Swrve SDK version 4.11 or higher and, for iOS, completed the additional integration steps for Advanced Push Notifications outlined in the iOS integration guide. Check the OS of your device to make sure it supports rich notifications (see Prerequisites above). If the media in your notification content includes any custom properties, check the QA device logs to make sure that a value exists for the specified property. On iOS 10, there is an intermittent issue with notification service extensions where, in some QA or sandbox instances, the rich media attachment is not displayed. This is a common issue that has been raised with Apple, but should not affect the production version of your app.